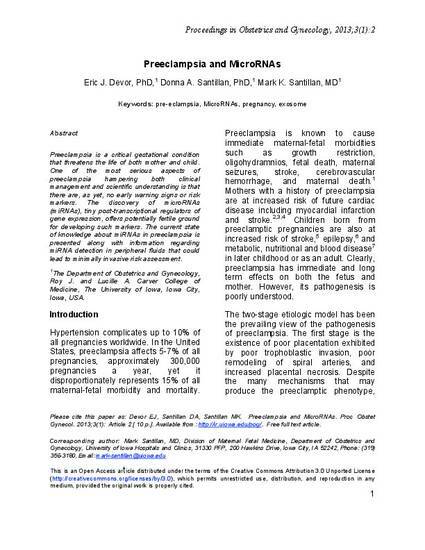 Preeclampsia is a critical gestational condition that threatens the life of both mother and child. One of the most serious aspects of preeclampsia hampering both clinical management and scientific understanding is that there are, as yet, no early warning signs or risk markers. The discovery of microRNAs (miRNAs), tiny post-transcriptional regulators of gene expression, offers potentially fertile ground for developing such markers. The current state of knowledge about miRNAs in preeclampsia is presented along with information regarding miRNA detection in peripheral fluids that could lead to minimally invasive risk assessment. Copyright © Eric J. Dover, Donna A. Santillan, Mark K. Santillan, 2013.